I had the opportunity to speak with a great group of students from the New Jersey Governor’s School of Engineering and Technology—a summer program for high-achieving high school students. Students in the program complete a set of challenging courses while working in small groups on real-world research and design projects that relate to the field of engineering. Governor’s School students are mentored by professional engineers as well as Rutgers University honors students and professors, and they often work with companies and organizations to solve real engineering problems. The team of students I talked to partnered with Silver Line by Andersen, a leading U.S. manufacturer of vinyl windows and a subsidiary of Andersen Corporation, to assess the manufacturer’s processes and identify possible improvements. The students took on the role of Silver Line industrial engineers and looked for opportunities to boost productivity and decrease costs. Silver Line offers various types of glass, in addition to custom window and door shapes, and offers more than 460 different configurations of windows and doors. The company’s complex manufacturing process involves numerous steps, many inputs and suppliers, and several machines and operators. With guidance from Silver Line engineers and mentors from Rutgers, the students were asked to investigate the window-making process at Silver Line’s New Jersey facility and propose process improvements that would result in the highest return on investment for the company. The team used the process data they collected to create visual diagrams, including SIPOC, Value Stream Maps, and process maps, in Companion. The students used the SIPOC template in Companion to define the scope of the process and its principal suppliers, inputs, outputs, and customers. The diagram helped the team understand exactly what was needed to begin a certain process, while also clarifying the transition between starting and finishing materials. 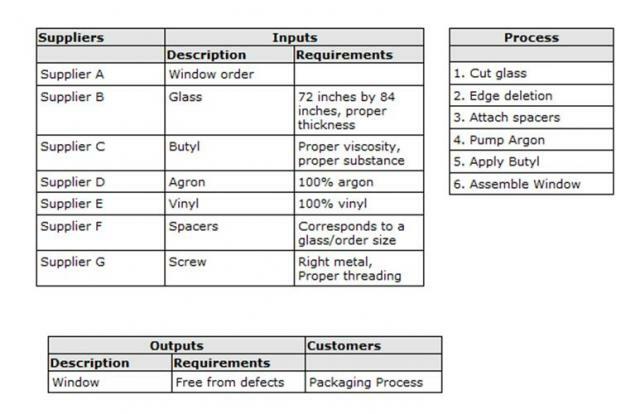 The SIPOC above summarizes Silver Line’s window-making process from glass-cutting to window assembly. In addition, the students built a Value Stream Map in Companion that showed the flow of materials and information from the beginning of the process to its end. This not only helped them to map out the completion of an order from a customer’s initial request to product shipment, but also indicated which steps of the process added value, and which did not. The Value Stream Map above demonstrates one window’s progression through the assembly line at the factory. 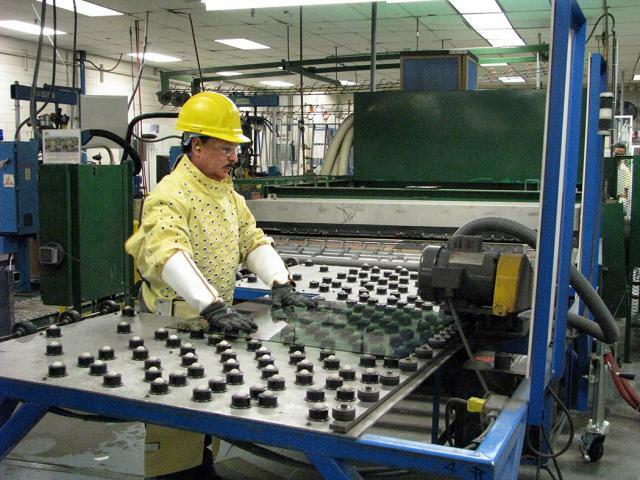 The facility operates multiple assembly lines simultaneously, handling various thicknesses and types of glass. The data the students collected on the window-making process was also organized with process maps. Using Companion to build their process maps made it easy to individually depict the various stages of the overall process, including class cutting, edge deletion, spacer attachment, argon application, butyl application, and final assembly, while also recording the associated variables and metrics to process steps. “The process maps were a critical part of everyone on the team developing a thorough understanding of the processes we observed from start to finish,” says team member David Liedtka. “We were constantly presenting the progression of our project to Silver Line employees of various ranks with different levels of understanding of our project, and Companion organized our data in a way that was easy to explain even to employees with no previous quality improvement background,” adds Jenna Ritchie, another member of the student project team. The team’s initial investigation found that a prominent challenge faced by the company is glass breakage at various points of the window making process. To brainstorm the potential causes of glass breakage, they constructed a fishbone diagram in Companion. 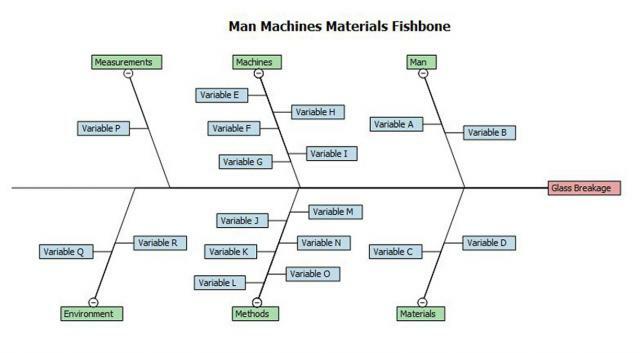 Using the Man Machines Materials fishbone template in Companion, the team could easily define possible causes of glass breakage and structure those causes into categories. Now, with a comprehensive list of possible causes for glass breakage, the students investigated the causes further and created a list of solutions. To determine which of the solutions would be best for Silver Line to focus on, the students wanted to take into account how each solution compared in terms of long-term benefits, cost of implementation, and the severity of the problem it solved. With the Companion Pugh Matrix template, the team was able to develop weight criteria they could use to evaluate each solution. The weight criteria were multiplied by each solution’s value, and then these totals were added together for each solution. The higher the final sum for each solution, the greater the opportunity to make a worthwhile change. By using the Pugh Matrix, the team was able to identify the best recommendations for improving Silver Line’s window-making processes—and decrease the amount of glass breakage that occurred on the line. By visiting on-site at Silver Line and analyzing the window-making process, the team of New Jersey Governor’s School students identified four specific areas of improvement to focus on. In addition to the long-term savings these solutions would have, the recommended changes were assessed as being cost-effective and relatively easy to implement. Silver Line was impressed with the work of the students and is taking their recommendations into consideration. “We especially appreciated that the solutions the students presented addressed many different aspects of our overall process, which will allow us to attack process improvements from a variety of angles,” says Scott Steurer, quality assurance manager at Silver Line. As for the students, the experience of working with Silver Line on behalf of the New Jersey Governor’s School was invaluable. “Doing our project helped me to see the attention to detail required in industry, and how even the smallest inefficiencies are magnified in large-scale manufacturing,” says David Liedtka. Interested in sharing how you use Minitab software in a blog post? Email us at publicrelations@minitab.com.